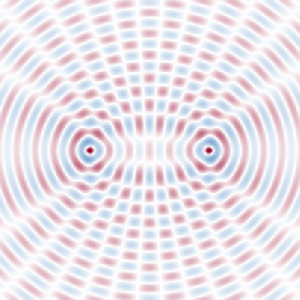 Figure 1: Standing wave interference pattern (showing the optical intensity) from the superposition of two elliptical Gaussian beams under some angle. In this case, the resulting total light field does not have an optical intensity which equals the sum of the intensities of the superimposed beams. Instead, its complex amplitude is the sum of the amplitudes of the superimposed beams. For example, the amplitudes of two equally intense light beams can have opposite signs at some location, so that they can cancel each other (destructive interference). On the other hand, with equal signs (equal phases) of both contributions (constructive interference), the total intensity can be four times that of the single beams. Nevertheless, the total energy is conserved in any case. For example, if two light beams of equal intensity, frequency and polarization are superimposed on a screen with some angle between the beams, an interference pattern occurs which consists of bright and dark stripes (see Figure 1). It is called a standing wave pattern, since the minima and maxima of the total optical intensity can stay at their positions, although the optical waves are moving with high velocity. Figure 2: Snapshot of the superposition of two circular waves. Figure 2 illustrates the superposition of two circular waves with the same frequency but different source points. It shows a snapshot, i.e. the field distribution at one particular moment in time. As time progresses, the spatial patterns move away from the point sources. 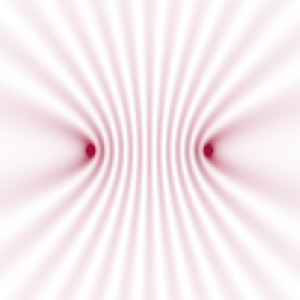 By averaging the optical intensity corresponding to this pattern over one oscillating period, the interference pattern in Figure 3 is obtained. Figure 3: Time-averaged intensity pattern. Interference effects also occur in multimode fibers. Figure 4 shows the simulated output intensity profiles of a multimode fiber when an input beam is scanned across its input face. Figure 4: Intensity profiles at the end of a multimode fiber, shown as animated graphics. A Gaussian input beam is scanned through the horizontal line (slightly above the center of the fiber core). This model has been made with the RP Fiber Power software and is described in more detail on a separate page. Interference governs the operation of interferometers, which are used in many variations for a wide range of applications, and is the basis of holography. 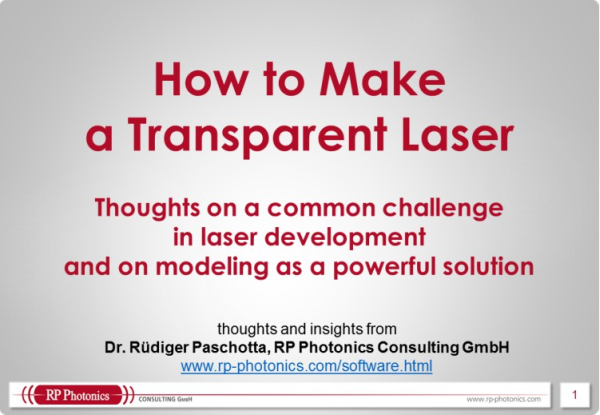 Interference is essential for the formation of resonator modes, and thus for many physical details of laser operation. Interference is essentially involved in the effect of spatial hole burning. Interference is the basis of detecting beat notes in optical metrology.